Please bear with us as we update our web property. Organic Click-Through Rates - Any Update for 2016? Over the years I have written about organic click through rates on a number of occasions. I was part of the team at Enquiro that released groundbreaking research in this area over a decade ago. Where and what people click on has always been fascinating to me. Even more interesting is the fact that traditionally Searchers click on organic results the majority of the time. Still around 80% of the time. However with Google continuing to exploit their search results pages with more ads, knowledge graph results, ever changing local packs and more, the organic real estate on a SERP (Search Engine Results Page) continues to change. It stands to reason then that the organic click through rates are also changing. The fact is that it is difficult to get an accurate read on organic click through rates. Things like personalization of Search results make it challenging to find consistency in click through rates. However it is no secret that if you want to receive the lionshare of organic traffic being within the top three organic listings is still the money spot when it comes to real estate on the SERPs. I wanted to share an article that I wrote in 2014, while at Mediative. It was an update based on some of our research on search and click activity. The article is reproduced in it's entirety here sans some of the images. Search Engines Results Pages have changed dramatically in recent years. How has this changed the impact of the prime real estate on a Google SERP and how does this impact where people actually click when they arrive on a Google SERP? Of course that is dependent on the type of search that a user conducts but historically you really want to be found in that prime real estate of a SERP. 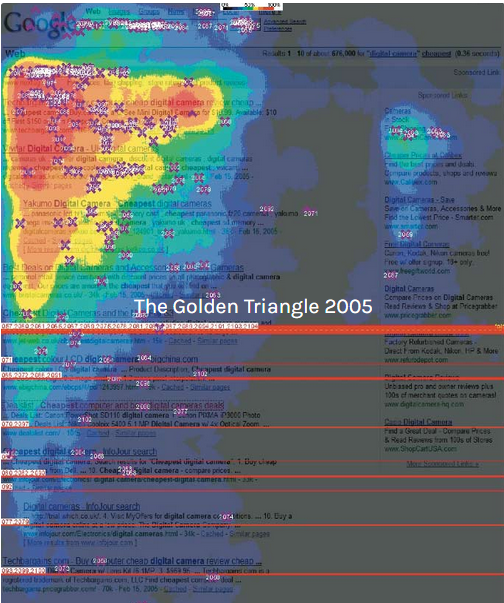 We have previously defined some of this prime real estate as Google’s Golden Triangle wherein the top three or four results on the SERP are the place to be if you want to be seen by a good proportion of searchers. 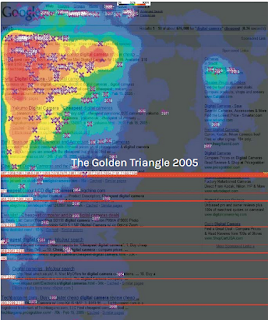 In addition, we have performed numerous eye tracking studies over the years that have provided some amazing insight into just where people’s visual tendencies are when they arrive on a search results page. You can download our original research here. It is one thing to see and view the results, but where do users actually click when they arrive on the SERP? Numerous studies (including our own) have identified that the majority of clicks happen on organic listings. In our original study, when the Google SERP was pretty simple in nature, we saw that users clicked on organic results 70% of the time and clicked on Paid listings 30% of the time. Of course since then Google has made a number of changes to their results pages. In 2007, we were introduced to personalized and Universal Search where the 10 blue links transformed to include elements such as video results, news results and more than just the ten blue links. Google has since added local results, knowledge graph results, carousel results and other dynamic changes to their SERPs. There’s no question that the aesthetics of Google’s SERP has undergone quite the transformation in recent years. Data from our earlier studies suggests that nearly 73% of the clicks on a Google results page went to an organic result. 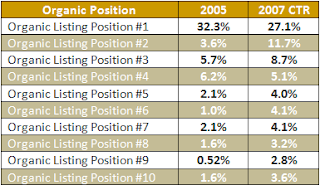 The breakdown of organic click-through rates can be seen in the table below. In 2011, Slingshot SEO released a study stating that the top organic spot captured 18.25% of the clicks; this is lower than what most studies have concluded. It just illustrates the fact that there is discrepancy due to a number of different factors as mentioned above. I have written about organic click-through rates on multiple occasions in the past and one thing that is for certain is that the higher up on a SERP that you are with your organic listings the greater chance you have of obtaining the click. Advanced Web Ranking recently released some data on organic click-through rates on Google’s SERPs. Their findings back up our previous and most recent research. They found that, on average, a little over 71% of Google searches conducted resulted in clicks on page one in Google and that the first five results accounting for 67.60% of all clicks. Looking at our previous data, we suggested that the top five organic results acquired 54.7% of the clicks. Our most recent research found this to be closer to 65%. Of note from the Advanced Web Ranking study is their data as it pertains to mobile. The assumption that many have made is that we would expect mobile CTR rates to be even higher for the top three results. (A smaller viewing area means that more of the content is below the fold.) In reality data from Advanced Web Ranking suggests that mobile CTRs are very similar to what we are seeing with desktop. Getting back to desktop search, our most recent research from August 2014, suggests that the top five organic results account for approximately 65% of the clicks. So the findings from Advanced Web Ranking and Mediative’s own research are quite close. In fact, as taken from our own research here is the breakdown of the click data and how it’s distributed across the different elements of the SERP. 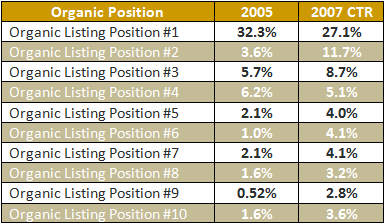 We can see the importance of still being in the top organic spot but look at how being in positions two or three has changed over the years. There is no question that even with all of Google’s dynamic changes to the SERP, having a solid organic ranking is key to attracting the click and acquiring traffic to your web properties. So what happens with local queries you might ask? Our research also illustrates users click activity when local results were found above and below organic listings. For example, did you know that when there is a local listing box above organic listings the top two organic listings garnered 45% of the page clicks? In an extremely weird coincidence, as I was preparing this post, Philip Petrescu (from Advanced Web Rankings) has posted a piece on Google Organic Click-Through Rates in 2014 where he has cited our past research data from Enquiro. 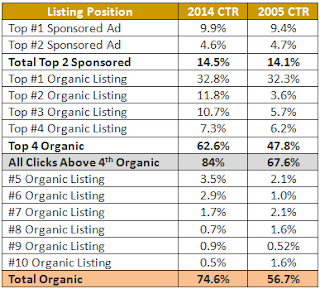 He has listed a comparison of previous CTR studies, so rather than replicate that here, you can see the comparison by going to: http://moz.com/blog/google-organic-click-through-rates-in-2014. It is great to see so much research being done in this area. As website owners and online marketers, understanding how people engage with a search results page can help identify opportunities to gain visibility in areas where we know people will actually be focusing on. While the move to mobile search from desktop is in full force, early findings suggest that users have similar click-through habits when it comes to the search results that are presented to them. With mobile activity, we make the assumption that people are all about the convenience factor. However the fact remains, is that they are still looking for the most relevant result based on their intent. (Even if that means they may not know what the most relevant result may be). While it may no longer be about rankings, understanding organic CTR can illustrate just where it is that you should try to be found on a search results page. And while we cannot control where and on what people click, there are some things that you can do to get users to engage with your listings. Produce highly relevant content – Building out relevant themes for your content still remains one of the best ways that you can gain visibility in Search. Becoming an authority for these topics can help ensure that you are found within the prime real estate of SERPs. Again, the magical equation is not just to drive traffic to your web properties, but to drive qualified traffic to your websites that will ideally follow up with some sort of engagement with your brand. If you have the “goods” that people are looking for and if you have a solid brand reputation, you should be able to gain visibility within Search results pages. If your messaging resonates with the user’s intent, you should be able to inherit the click as a result. Optimize for the long-tail – While search activity may be lower for these types of keywords, searchers for these types of terms have a more distinct action in mind. Someone who searches for “all-season tires vs all weather tires” has a very specific intent. Someone who searches for “Nokian all-season tires” has an even more specific intent. Tailoring your content to focus on the long-tail can help entice clicks especially knowing that long tail keyword searches show higher CTRs for first page listings. Optimize for Blended Search – whether it is desktop search or mobile search, optimizing for more than just a web page is becoming increasingly important. People are engaging with video, with maps, and with GEO content, and as a result, optimizing for these elements can help you gain visibility within the search results. Optimize for the Knowledge Graph and optimize for the convenience factor to improve the amount of impression that you receive. Impressions are one thing, but organic click-through rates and actual organic clicks are what we are after. We are looking to drive traffic to our website which at the heart of it our websites are nothing more than a glorified brochure or guide for our business. It’s what we do with our messaging and the clicks that we do get which can have the greatest impact on our bottom line. Are you in it to win it, or are you in it to simply be an also ran and a potential rung on the ladder? People still click on organic listings regardless of desktop or mobile search, but it is all about convenience and being located in the prime real estate of a Google search is still where you want to be. The ever changing results pages, increased Web results competition and Google's use of machine learning (see: RankBrain) can make it difficult to achieve this visibility. It does not come easy. You have to work at it. You need to ensure that your content marketing efforts are speaking to the needs of your targeted audience. Your site still needs to be sticky, that is your content needs to be highly engaging and probably most important for mobile is that your site and your content has to provide answers to what searchers are looking for. As we enter the Spring of 2016, comScore has released their most recent report on the Search Engine market for the US. Data from March illustrates that Google is still the dominate player in Search with a 67.5% market share in the US market. To put this into perspective, there were 19.4 billion core searches done in March 2016 (up from 17 billion in February), Google was responsible for nearly 12 billion of those. I'm often asked why the focus on Google and not other search engines such as Bing or Yahoo? While the reason is that in North America Google has been the dominant leader in Search over the past decade. 19.4 billion explicit core searches were conducted in March, with Google Sites ranking first with 13.1 billion (up 9 percent). Microsoft Sites ranked second with 3.6 billion searches (up 10 percent), followed by Yahoo Sites with 2 billion (up 8 percent). Google is still the dominant player when it comes to Search. However with their announcement in October 2015 that RankBrain is a core piece of their ranking algorithm and with recent search results being poor depending on your query, will Google lose market share? Unlikely, but as people continue to become search savvy and continue to look for information in a mobile, conversational manner, will Google be able to keep up? I'm baaaaaaack! It has been quite some time since I posted on Marketing Jive. A lot of things have happened since my last post. I left a digital marketing company that I had worked for over a dozen of years, I formed my own consulting company working with digital agencies and site owners to help make the world of organic search results a better place and I have reduced the amount of stress in my life greatly. It has been an eventful year to say the least. I am resurrected Marketing Jive where I will be focusing on sharing great information about organic search, but focusing on what I am really passionate about and that is website audits and content strategy. I am hoping to increase the frequency of posts (time permitting) and if any of you would like to contribute to Marketing Jive please feel free to reach out to me. I will be using Marketing Jive as portal for my company Jody Nimetz Co. So you will be seeing some changes on the blog over the upcoming weeks (including a slight redesign). Thanks for checking us out. Start a blog – in 2015 if you don’t have a blog, you are missing a great opportunity to quickly populate content on your site. The difficulty in producing a blog is in the resources required to maintain and contribute to it. However, blogs can be well received by your audience and can be a great mechanism for building quality links to your site. Produce a list of top content pieces – whether it is a list of your top 10 blog posts for 2015 or your top 10 articles on <insert topic here>, people will have an opportunity to re-engage with this content. The net impact could be additional social engagement (Shares, Likes, Retweets), more feed subscribers or more repeat visitors.